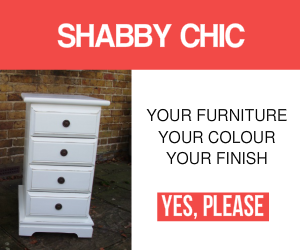 Dark wax or neutral wax for your shabby chic wax finish? Because it's when we offer the choice of dark wax or neutral wax that we get a perplexed look. And, of course, that's quite natural. How dark is the wax? Will the wax mask the colour of the paint? Will the wax protect the paintwork? These really are important questions that need some answers. 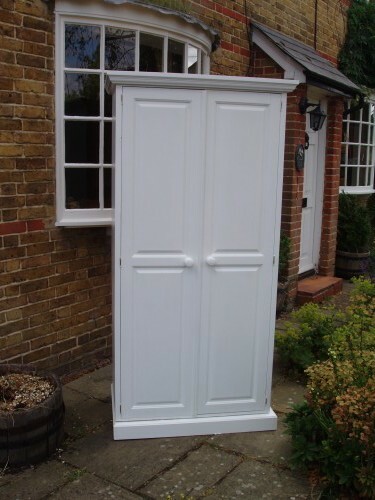 After all, everyone wants to protect their new paintwork…even shabby chic deserves a little helping hand! And so, a wax finish will give your painted furniture some added protection in the home. There are two reasons we like to finish all of our painted furniture with a layer of wax. It provides an attractive sheen. Typically it was Briwax that we rubbed in with a rag or a brush. But, more and more we use Annie Sloan wax. Our pictures on this page show the same wardrobe. The first shows off a clear shabby chic wax. And then, the second shows the dark shabby chic wax and also some shabby chic sanding. So, if it's an antique look that you are after then the dark wax will give you that look. Dark wax will positively cling to all the underlying texture of the wood, reinforcing the pattern of the grain. Thus, it will sit in the cracks and crevices, around the mouldings and pelmets. Note, also that the dark wax won't stick to rounded convex surfaces, so drawer knobs will appear lighter than their surroundings. Alternatively if you want your choice of striking Farrow and Ball colours to stand out, then a clear wax is likely to be your choice. Of course, you can see this with these bedside tables's shabby chic treatment. Choices. Choices. So, when the time is right, please don't hesitate to get in touch to discuss. 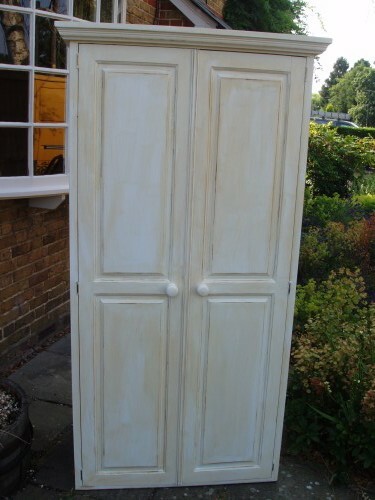 Previous Post Shabby Chic Transformation For Dressers Next Post Your Choice Of Shabby Chic Wax. Dark Or Neutral?